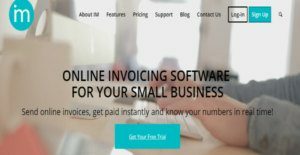 Invoice Meister is an online invoicing solution for freelancers and small businesses. It helps you create quotes that can be effortlessly converted to online invoices, track your expenses, get paid more quickly, and get precise reports on your company’s profit and costs. You can save time by automating your daily actions with automatic notifications and recurring invoices. Invoice Meister is an all-in-one accounting tool that you can use to enter your expenses and revenues, add your bank account and organize your accounts properly. The best part is the system is easy to use and you can effortlessly configure it for your business requirements. There is no need for complex installations or detailed training. Since the software is cloud based, you can login from anywhere, anytime, using any internet-enabled device to access real-time business info set up for you. You can rest assured your confidential info will be protected as the vendor applies bank-level security, PIN security and automatic backups to give you confidence and peace of mind. Finally, you can add as many users as you wish and assign access permissions to each one based on their role. Invoice Meister helps freelancers and small business owners to easily create and send online invoices in multiple currencies. The solution makes your work simple by offering a range of professional invoice templates. Set up recurring invoices to save time. Simply define the invoicing conditions once and the system will automatically send the same invoice to the customer using the same conditions for the designated time period. You can capture and track your expenses to learn about your spending behavior. Plus, you get in-depth financial reports that give you a clear picture of your business. The software provides detailed analytic info to help you keep track of your financial aspects and make informed decisions. You get unlimited access to reports such as accounts payable, accounts receivable, customer card, item card, balance sheet, and profit and loss. Invoice Meister allows you to track your payments properly. Enter payment directly, set your beginning balance and watch your current balance increase. A major highlight is the automatic notifications the system sends for every recurring or overdue invoice. This automation helps to minimize late payment concerns and enables you to get paid more quickly. The application empowers you to create invoices in all common currencies. Thus, you can send online invoices in the correct currency to your clients in any country. Simply select the right currency and the platform will automatically calculate the latest exchange rate to save you the task of searching for recent rates. The vendor automatically upgrades and updates the software to ensure you get to use the newest version. In addition, the vendor automatically backs up your data and keeps all information saved, secure, and easily accessible anytime. Finally, you can count on premium support during business hours to get your issues resolved. Support is offered via phone, Skype and email. For self-help, you can access the knowledge base and video tutorials on the product’s official website. What Problems Will Invoice Meister Solve? Scenario 1: Start up business. The entrepreneur is just starting his/her business and had to wear many hats: to deal with invoices, expenses, employees and administrative tasks. Having excellent invoicing software like Invoice Meister can really automate important tasks and reduces the time needed to deal with everyday business tasks, numbers, and reports. Scenario 2: Freelancer having to deal with many clients. Scenario 3: Small business using different software for different purposes. Each company has different wants and needs a system that can be personalized for their size, type of staff members and customers, and the specific industry they are in. For these reasons, no software can offer perfect features off-the-shelf. When you try to find a software system, first be sure what you need it for. Read some Invoice Meister reviews and ask yourself do you want basic tools or do you need sophisticated features? Are there any industry-specific functionalities that you are seeking? Obtain the answers to these queries to aid your search. There are multiple aspects that you need to reflect on and these include your budget, specific business needs, your organization size, integration requirements etc. Take your time, use a few free trials, and finally select the system that offers all that you require to boost your company competence and productivity. How Much Does Invoice Meister Cost? We realize that when you make a decision to buy Billing and Invoicing Software it’s important not only to see how experts evaluate it in their reviews, but also to find out if the real people and companies that buy it are actually satisfied with the product. That’s why we’ve created our behavior-based Customer Satisfaction Algorithm™ that gathers customer reviews, comments and Invoice Meister reviews across a wide range of social media sites. The data is then presented in an easy to digest form showing how many people had positive and negative experience with Invoice Meister. With that information at hand you should be equipped to make an informed buying decision that you won’t regret. What are Invoice Meister pricing details? What integrations are available for Invoice Meister? If you need more information about Invoice Meister or you simply have a question let us know what you need and we’ll forward your request directly to the vendor.